AU.S. AirForce robotic space plane continues to maneuver in Earth orbit,according tothe latest observations from skywatchers. The reusable space drone hasbeencarrying out tasks using a suite of classified sensors and may benearing itsmission's end, according to comments from Air Force officials. Thespacecraft is the AirForce'sX-37B space plane, also known asthe Orbital TestVehicle 1, which launched on its maiden flight on April 22 atop anAtlas 5rocket. Official detailsregarding the space plane's whereabouts, its classified payload andprojectedlanding date are scarce ? more mum than informative. "Nothingnew," said U.S. Air Force Major, Tracy Bunko, a spokeswoman for themission at the Pentagon?s Air Force press desk. 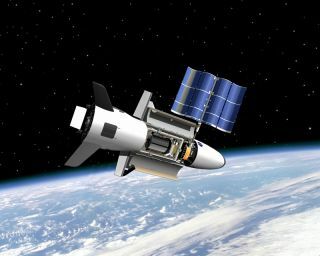 "Thefirst flight of the X-37B/OTV-1 is ongoing and continues to focus oncheckingout the on-orbit performance of the vehicle and proving thetechnologiesrequired for long-duration, re-usable space vehicles with autonomousre-entryand landing capabilities," Bunko told SPACE.com. Bunko saidthat after the X-37B test objectives are satisfied, "we look forward toasuccessful re-entry and recovery at Vandenberg Air Force Base,California." No landingdate has been scheduled, she added. This SPACE.comX-37B graphic illustrates some details of the space plane,its solar arraypower plant, and its relative size. Meanwhile,amateur skywatchers are keeping tabs ? as best they can ? regarding theorbitalantics of the mystery space plane. As to what the overall mission is ofthevehicle, they too can only guess. "Theshortest and best answer is that I don't know," said space sleuth andveteran skywatcher Ted Molczan, a leader in a network of heads-upamateursaround the world monitoringtheactions of the X-37Bspacecraft. Molczanspeculates that the spacecraft's orbit appears to provide severallandingopportunities each day. Therefore, special pre-landing maneuvers of thespaceplane are not required. "It hasmade four significant maneuvers, including the latest one. All of itspreviousorbits resulted in ground tracks that nearly repeated after two, three,four orsix days," Molczan said. "Ground tracks that nearly repeat after two,three or four days have long been a feature of U.S. imagingreconnaissancesatellites, which leads me to suspect that X-37B is carryingexperimentalsensors for that purpose." Molczan'stheory appears to be backed up by similar thoughts from other veteranspacewatchers. "Themission is demonstrating one of the primary uses planned for the X-37B:flyingattached sensor payloads so that their performance can be assessedbefore theyare integrated with much more costly free-flying systems," wroteveteranspace reporter Craig Covault in the November issue of the magazineAerospaceAmerica, published by the American Institute of Aeronautics andAstronautics. But exactlyhow the robotic space plane fits into the U.S. security and spaceintereststoday and tomorrow leaves room for debate. "I justfind it a fascinating program because a hypersonicspaceplane was one of thefirst space programsI looked at ? 25 years ago," said Joan Johnson-Freese, a faculty memberofthe U.S. Naval War College in Newport, R.I. and a leading expert onspacesecurity issues. "Even then it wasn?t clear what it would be used for,butequally clear that the Air Force really wanted one." Johnson-Freesetold SPACE.com that "obviously, persistence pays off." "Thatsaid, this technology could turn out to be the next GPS-type hardware ?whereits uses aren't clear until it becomes operational. Given the fewreally newtypes of transportation technology since the space shuttle, it's timeforsomething new and newer, and clearly NASA doesn?t have the resources." Otheranalysts question the purpose, duties, and usefulness of the vehicle. "Itstill seems to me that the enthusiasmforX-37B and itsfollow-ons grow out of amisunderstanding of the physics of putting things in orbit andmaneuvering inspace," said David Wright, a senior scientist and co-director of theGlobal Security Program at the Union of Concerned Scientists,headquartered inCambridge, Mass. "This appearsto be a case in which trying to make a flexible, one-size-fits-allsystem makesit suboptimal for essentially all missions," Wright said. "I stillhaven?t seen an analysis that explains its purpose and shows that itmakessense compared to alternatives." Wright andUCS colleague, Laura Grego, recently co-wrote "Securing the Skies" ? areport that outlines 10 steps that the U.S. should take to safeguardspace. One step inthe outline noted that the U.S. should declare it will notintentionally damageor disable satellites operating in accordance with the Outer SpaceTreaty, andpledge that it will not be the first country to station dedicatedweapons inspace. The Obama administration should press other space powers to makethesame promise, the report explains. "Ipersonally think the X-37B space plane is just a new toy for geeks inthemilitary," said Ting Wang[s1] ,a postdoctoralassociate at Cornell University's JudithReppy Institute for Peace and Conflict Studies. Wang saidthat satellites can do almost all the missions the space plane can do,and theycan do it at a much cheaper price. "The only thing the space plane cando,[that] others can't, is to bring down a satellite and repair it." However, thecost of doing so is questionable, Wang said. Furthermore,the X-37B is a small vehicle with a payload capacity of roughly 500pounds (227kilograms), Wang advised. "It could hardly bring any valuable satellitedown to the Earth," he said. Given thatsatellitelaunch costs are so high, and electronic technology is developing soquickly,it likely to be much cheaper just to build a new spacecraft, Wang said. "Personally,I don't think the unmanned space plane make any sense", until rockettechnology has made significant progresses and enables thesingle-stage-to-orbit and reusable space plane, he added. Whatever thecase is today for flying the X-37B ? and as its first space test drawsto aclose ? the next show-and-tell milestone is bringing the bird home. The reusableX-37B Orbital Test Vehicle 1 was built by Boeing Phantom Works. It isabout 29feet (9 meters) long and has a wingspan of just over 14 feet (4 meters)across.It stands just over 9 1/2 feet (3 meters) tall and tips the scales atnearly11,000 pounds (about 5,000 kg). The craft?spayload bay is 7 feet (2.1 meters) long by 4 feet (1.2 meters) across. Given asuccessful de-orbit engine burn and reentry, the space plane is to wingits wayto a California touchdown in autopilot mode. If the incoming spaceplane straysoff its trajectory over the Pacific Ocean, the craft is outfitted withadestruct mechanism. Inpreparation for the X-37B?s automated home coming at the Vandenberg AirForceBase in California, workers have readied a runway to enable the robotspaceplane?s landing. According tothe Santa Maria Times newspaper, a small armada of workers havereplacedhundreds of landing strip plates along the flight line's centerline, ataskdone specially for the space plane. Edwards AirForce Base, also in California, serves as backup to the Vandenberglandingstrip. The X-37Bprogram is under the banner of the Air Force Rapid Capabilities Officein Washington,D.C., with one job description dedicated to demonstrating a reliable,reusable,unmanned space test platform for the United States Air Force. The spaceplane is being operated under the direction of Air Force SpaceCommand?s 3rdSpace Experimentation Squadron, a space control unit located atSchriever AirForce Base in Colorado. A secondX-37B ? called Orbital Test Vehicle 2 ? is also in development, headedfor atest mission slated for 2011.